Slade but made by R. Shugg of New York City. 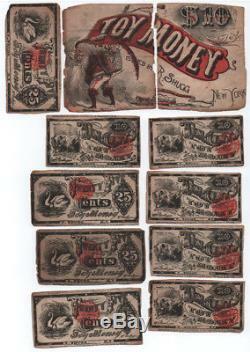 The cut paper pieces are not all the same size but, to a varying degree, are 4.25" x 2 1/8" for the dollar ones, (more or less) and 3" x 2 5/8" (more or less) on the cent examples. This piece is separated and the other pieces show their age and have wear and folds so they obviously were played with and enjoyed yet were special enough to be kept together these 146 years. They show various other animas such as swans, goats, parrots, pigs and horses which were to teach kids how to do arithmetic. We like the Kriss Kringle reference on the back of the large piece. We've had them for decades but can't take these things with us when we shed our mortal coil so it's time to pass them along to someone who might appreciate them as much as we have. Have any of you advanced collectors seen this before? T hese are in nice condition but please enlarge our images to judge this for yourself so you can be happy with them. 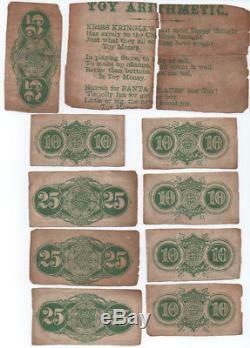 The item "Set of 1872 Kids Play Toy Paper Money by R. Shugg New York with SANTA CLAUS" is in sale since Thursday, July 26, 2018. This item is in the category "Collectibles\Holiday & Seasonal\Christmas\ Vintage (Pre-1946)\Figures\Santa". The seller is "butternut_grove_antiques" and is located in Beverly Hills, Florida. This item can be shipped to United States, Canada, United Kingdom, Denmark, Romania, Slovakia, Bulgaria, Czech republic, Finland, Hungary, Latvia, Lithuania, Malta, Estonia, Australia, Greece, Portugal, Cyprus, Slovenia, Japan, China, Sweden, South Korea, Indonesia, Taiwan, Thailand, Belgium, France, Hong Kong, Ireland, Netherlands, Poland, Spain, Italy, Germany, Austria, Israel, Mexico, New Zealand, Philippines, Singapore, Switzerland, Norway, Saudi arabia, Ukraine, United arab emirates, Qatar, Kuwait, Bahrain, Croatia, Malaysia, Chile, Colombia, Costa rica, Dominican republic, Panama, Trinidad and tobago, Guatemala, El salvador, Honduras, Jamaica, Antigua and barbuda, Aruba, Belize, Dominica, Grenada, Saint kitts and nevis, Saint lucia, Montserrat, Turks and caicos islands, Barbados, Bangladesh, Bermuda, Brunei darussalam, Bolivia, Ecuador, Egypt, French guiana, Guernsey, Gibraltar, Guadeloupe, Iceland, Jersey, Jordan, Cambodia, Cayman islands, Liechtenstein, Sri lanka, Luxembourg, Monaco, Macao, Martinique, Maldives, Nicaragua, Oman, Pakistan, Paraguay, Reunion.